I've just listened to the interview in its entirety and I loved it all. I'm looking forward to reading your memoir. I do particularly enjoy the way you bring a sharp intellect to all that you do and simultaneously speak and write in such an accessible style. Thank you. I've just finished listening to it Anne, and like Sandra, I loved it. I think your quality of mind and thought and reflection is remarkable. Also, you have a very beautiful voice - I could listen to you for hours and hours. I heard your interview yesterday and will now follow your blogs and look forward to your memoir. So much of your current experience reminds me of my mother's widowhood from the age of 59 until she was killed in a car accident at 73 years of age. It is so vital that we speak of our journeys so that we process the turmoil of emotions and so that others might draw some comfort, reassurance and assistance from them. 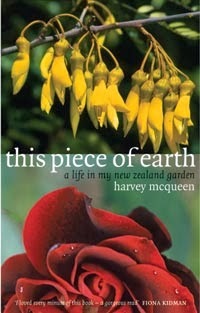 I love Harvey's "This piece of earth". It found me when I was in a particularly tough patch following Mum's death and in the midst of health issues for me. I am a gardener but not as devoted as Harvey was. I think of him often when a Tui sings in our tree. I send you very warm wishes. I live and work in the Middle East and should be retired but love my work and living here so... just one more year. I tune into either Kathryn Ryan or Kim hill most days - it helps me to keep in touch with beautiful New Zealand. Thank you so much for sharing your touching story yesterday with me via Kathryn. She was so gentle and understanding, and you were just lovely. I hope you enjoy your garden. Many times over the years in NZ I escaped to my garden for solace. There I could share my tears with the plants and hammer away at the soil, and go back inside feeling as though I had been 'kissed' better. Thankyou for sharing with us - it is kiwis like you I love hearing Kathryn and Kim talk to. Your blog is great too. I see NZ is ecpexting very heavy rain - will this be good for your garden? I just listened to your interview - I had downloaded it along with other RNZ interviews. Thank you for sharing the reality of your life. I wish you all the best.